One heck of a journey is what life is all about. 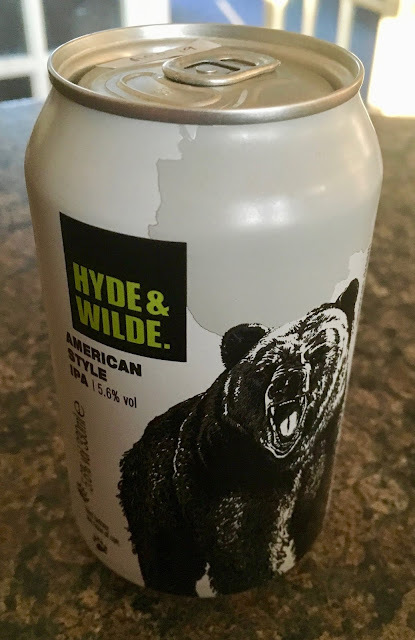 We all have a certain amount of control over our lives, but you never can tell what's going to happen next… One minute you can be trundling along quite happily, and the next minute you could be injured or worse; get eaten by a huge grizzly bear like the one on the front of the can! You can always stay out of the woods, I suppose. But you can't often control who you fall in love with. You just have to pick yourself up and try to heal from any injuries, just as much as you can cherish any love you're fortunate to find. You just have to keep going on your life's journey, and try to stay true. Anyway, enough of my musings… I've probably already had too much of this 5.6% volume IPA on writing this blog! American Dream has been boosted with citrus hoppy bitterness from Citra and Summit hops. So it should go well with my tuna baguette and sushi for dinner. On opening the can there was indeed and pale malt smell, but it was virtually overshadowed by an almost grapefruit flavoured blast of citrus hops. For an ex-barman I poured out the deep golden contents of the can remarkably badly! After twiddling my thumbs and "ho-humming!" for a while waiting for the froth to go down, this American Dream is a traditional tasting India Pale Ale through and true. There is instant sweetness from the pale and other malts followed by an almost knock-me-off-my-feet citrus thunderclap of hops that romps right into the aftertaste. Brilliant…! Now where's my tuna baguette?